Thanks to Tom Vincent for passing this one along. I would love to know from those of you familiar with comic books/graphic novels if there are other examples of the loyal slave narrative. [A more recent example can be found here.] It would also be nice to know a bit about the author of this particular issue. The publication date places the black Confederate narrative a bit earlier than my recent post on the influence of the television series, Roots. The Gunhawks were Kid Cassidy and Reno Jones. As introduced in Gunhawks #1 (1972), Cassidy was the son of a plantation-owning family in the antebellum American South, and Jones was an African-American slave of the family who was friends with Cassidy. They fought together for the Confederate States of America during the American Civil War, with Jones fighting the Union because their soldiers had kidnapped his lover, Rachel Brown. After the war, they became wandering gunfighters, the Gunhawks, and continued searching for Rachel. According to it, the black character, Reno Jones, did not fight for the Union but rather remained neutral until “Yankees” rampaged through their part of Georgia and kidnapped Rachel Brown. He then vowed to kill as many federals as he could. He and Kid Cassidy became gunfighters. While this clearly indicates a ‘loyal slave’ or ‘Black Confederate’ narrative at work, I’d suggest a third possibility. Given the publication of “The Gunhawks” in the early 70s, when Civil Rights fervor was still warm, I’d argue that the authors intended to show how blacks and whites could cooperate in times of strain. Yes, the silly context robs it of any historical credibility, but I think it may have a more presentist meaning. Wow, comics were 20 cents in 1972? Thanks for the additional link, Scott. I like the idea of this stemming from the Civil Rights movement. Thanks to the Civil Rights revolution, the white partner-black partner motif had become common in pop culture by the early seventies. James Garner’s “Skin Game” comes immediately to mind but there are many examples of “buddy cop” movies and programs. At the same time, there were last desperate attempts to attract a new generation to the dying western form, such as “Alias Smith and Jones” (which featured a character named Kid Curry). This strikes me as a simple blending of the two trends. The real question is…are those kids passing a basketball? Thanks for the references, Ken. I think they are playing dodgeball Ken! Thanks. I read it this morning. Great article ! And a link to Kevin’s article is included. I might suggest one correction. You could replace Southern partisans with Confererate partisans ! In preparing my college bound student company (PUSHS – Poly US Colored Troops History Society) for their Living History presentations, one of them selected a similar story to reenact. It involves a runaway slave who found freedom with a white family who taught him to read and write. I think it’s important to have more stories told of the “grey line” that existed between blacks and whites in this country rather than always focusing on only one side of race relations during the Civil War. Take a look at PUSHS on Facebook or on our website. If you want to hear more of the other side of the Civil War era get in touch with us or leave a comment on our ning.com site. We will never understand ourselves as we exist today until we learn more about our ancestor’s expressions for cooperation and freedom. Only when all contributions are known and accepted will we benefit from the rich legacy that was truly passed to us from the Civil War era. Wow, comic book art looked so great in that period (visually speaking). But as for the actual piece, I would agree that it was inspired by the Civil Rights movement and the desire to get black characters in equal positions (or at least into comics at all — there were no black superheroes until Lee/Kirby introduced the Black Panther in 1965). Also, I think the unusual “kindness” of the masters was to make the white character more endearing. Though, I think a harsher slave/master relationship would’ve been more dramatically interesting. A better example of race relations in comics would be a Green Lantern issue from 1972, set in the present day. The Guardians of the Universe select a black architect and Marine veteran, Jon Stewart, as the ‘back-up’ GL of the Earth Sector should standing GL, Hal Jordan, be killed in action. Hal (a white-bread, Conservative 30-something), is ordered to train Jon, and the two don’t get along at first. Then a racist senator (who rants about “darkies” in his speeches) is shot at and Jon lets the shooter escape. Hal is livid, until he realizes that the shooter’s gun was full of blank rounds, and Jon was actually capturing the real shooter in the parking lot. Granted, Jon talked in jive Blaxplotation lingo, but he was very honorable and intellegent, and even willing to rescue a dispicable racist politician. Later, in the 80s, Jon did replace Hal and is still a major character today. 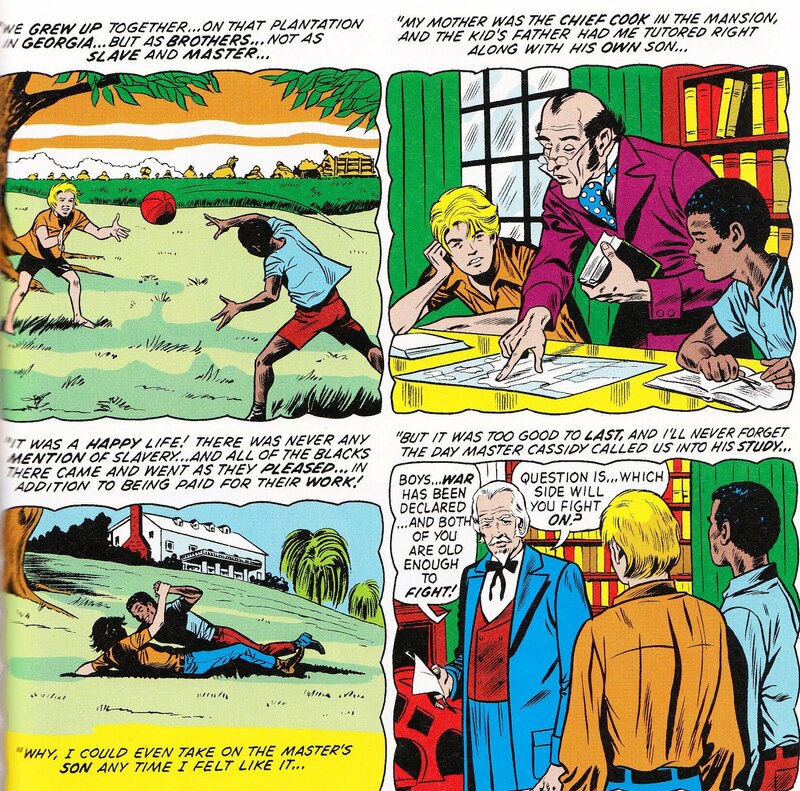 I know that has nothing to do with the Civil War, but it’s a good example of positive black portrayal in older comics that didn’t downplay the problems of race relations. By comparison, this Gunhawks story from the same year seems very backwards and ignorant. This strip appears to be the artwork of John Buscema, who was a very busy artist for Marvel DC and Dell comics. I was a comic collector in the ’70s and ’80s and I’m very familiar with his work. Comics of this period had a number of bi-racial fighting team-ups during this time. One of them, also historically inaccurate (but much loved by this writer) was “Sgt. Fury and His Howling Commandos,” a small WWII fighting unit which inluded one Black soldier, even though the military was not legally desegregated until 1948. There were some instances of integrated fighting in the Army during the war, but not as shown in “Sgt. Fury.” Besides this comic book, there was also the popular movie “Kelly’s Heroes” (1967). It’s wonderful that the desire of someone existed to show racial harmony and teamwork. too bad it was just fiction which led to the miseducation of others. Seduced by the gallant, plucky, cavalier romance of the Confederacy, it’s no surprise why Marvel Comics chose “The Gunhawks” as Confederate gunfighters. There’s also the Haunted Tank, about a Stuart tank in WW2 haunted by the ghost of JEB Stuart, who would speak to his descendant and give advice in battles. There was a black soldier in that, but I forgot his name (again, the military was not desegregated yet). Also, the tank always flew a Confederate flag (which was actually very common in WWII). I remember that strip, too. I was really into the WWII comics. As for other bi-racial fighting teams, there was also Power Man and Iron Fist and Captain America and the Falcon. From the blog it appeared in: It was written by Gary Friedrich, drawn by Syd Shores, and edited by Roy Thomas. Now you know, and knowing is half the battle. (It appears in “Marvel Firsts: the ’70s” vol. 1, which is on my subscription list for next month. I may write some more comments when I’ve read the whole thing in context). Previous post: Where Can You Display the Confederate Flag These Days?